A new study by Nina Skjæret and co-authors from FARSEEING group evaluated movement qualities which are elicited by stepping exergames. The study provides important lessons for the design of exergames for fall preventive exercise in senior citizens and illustrates the value of including analyses of movement characteristics when designing such exergames. Background: Exergames are increasingly used as an exercise intervention to reduce fall risk in elderly. However, few exergames have been designed specifically for elderly, and we lack knowledge about the characteristics of the movements elicited by exergames and thereby about their potential to train functions important for fall risk reduction. Objective: This study investigates game elements and older players’ movement characteristics during stepping exergames in order to inform exergame design for movement quality in the context of fall preventive exercise. Methods: Fourteen senior citizens (mean age 73 years ± 5.7, range 65 – 85) played 3 stepping exergames in a laboratory. Each of the exergames was described with respect to 7 game elements (physical space, sensing hardware technology, game graphics and sound, model of user, avatar/mapping of movements, game mechanism and game narrative). Five movement characteristics (weight shift; variation in step length, speed, and movement direction; visual independency) were scored on a 5-point Likert scale based on video observations of each player and each game. 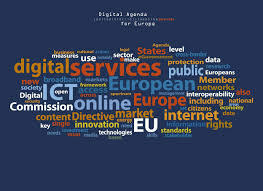 Disagreement between raters was resolved by agreement. Differences in scores for the 3 exergames were analyzed with a multivariate one-way ANOVA. Results: The Mole received the highest sum score and the best score on each of the 5 movement characteristics (all p values <0.0005). LightRace scored the lowest of the 3 exergames on weight shift and variation in movement direction (both p values <0.0005), while DanceDanceRevolution scored lowest on step length variation and visual independency (p < 0.03 and p < 0.0005, respectively), and lower than The Mole on speed variation (p < 0.05). The physical space players used when exergaming and the on-screen representation of the player, affected movement quality positively as indexed by multiple weight shifts and variation in stepping size, direction, and speed. Furthermore, players’ movements improved when playing speed-affected game progression and when the game narrative was related to a natural context. Conclusion: Comparing differences in game elements with associated differences in game movement requirements provides valuable insights about how to design for movement quality in exergames. 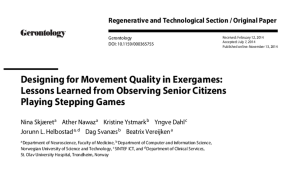 This provided important lessons for the design of exergames for fall-preventive exercise in senior citizens and illustrates the value of including analyses of movement characteristics when designing such exergames.